They came from every decade and every part of Webster University. They were the presenters, the demonstrators, the dancers and the shakers who put on a show from morning till night on Nov. 13 for "Dance Through The Decades," one of the final events of an illustrious yearlong centennial celebration. From the Lindy Hop and the Cha Cha Slide to Ballet and Classical Thai Dance. 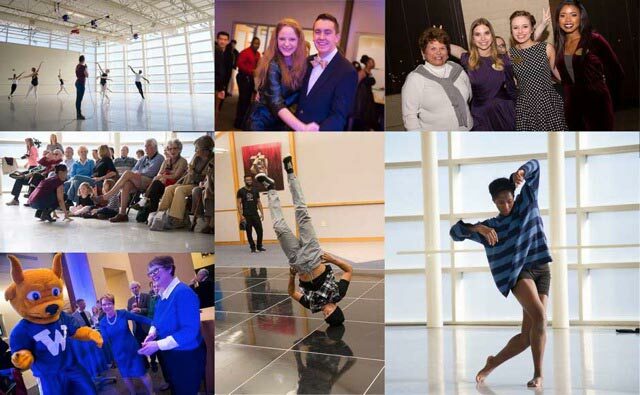 From the roaring 1920s to the hip hop of today, students, alumni, faculty, staff and community friends helped fill an eclectic day of dance that closed with a reception and a Campus Activities formal for everyone at The Edge of Webster. The next night, the Centennial Gala raised more than $1.2 million for student scholarship funds, capping a marvelous formal finale to a milestone year in Webster University history. See and share more snapshots from the day's many events, performers and presenters in the following two Facebook albums (album 1, album 2). From the roaring 1920s to the hip hop of today, students, alumni, faculty, staff and community friends helped fill an eclectic day of dance. See more photos in the Facebook albums. Ron Gibbs is the Development Officer for the Leigh Gerdine College of Fine Arts. Ron comes to us as a Broadway veteran and director/choreographer. While living in New York City, he was the assistant to the Tony-award-winning Director/Choreographer Susan Stroman. Ron has worked with such icons as Elaine Stritch, Mickey Rooney, Eartha Kitt and the irrepressible Carol Channing. Lara Turek, serves as the Development Officer, Research & Analysis at in the Office of Advancement. Prior to her career in the nonprofit industry, Lara spent 6 years as a Radio City Rockette and a total of 10 years as a professional dancer. Growing up in the 1950s and 1960s in St. Louis. Remembering the S. S. Admiral, the building of the Gateway Arch, Elvis, the St. Louis Browns, Ike and Tina Turner, Gaslight Square, The Beatles, crime, Radio and TV, Vincent Price, burlesque...and many more blasts from the past. A discussion of some of the important distinctions, but also the significant connections between the two decades. "We Were Going to Change the World in the 60’s! So What Happened? A Very Un-Scientific Look at the 70’s and 80’s.” A look back with legendary KSHE rock DJ, Radio Rich Dalton. An exciting experiential look at social dance trends from Hip Hop culture from the 1990s to the present. Attendees are invited to participate in learning Hip Hop dance steps. 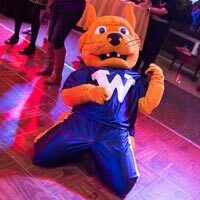 The 2015 Centennial Formal, a free event with music, food and dancing for the entire Webster University community at The Edge of Webster, 359 Marshall Ave, Webster Groves, MO 63119. Presented by the Webster Film Series. Enjoy an eclectic selection of dance films and documentaries. Gene Kelly, Debbie Reynolds and Donald O’Connor star in one of the most endearing musicals - filled with memorable songs and lavish dance numbers. Set during the advent of “talkies,” Don Lockwood (Kelly) must overcome his co-star’s shrill voice and her jealousy for his love interest and rising star Kathy Selden (Reynolds). The relationship between an aspiring dancer (Bill “Bojangles” Robinson) and a popular singer (Lena Horne) provides a review of the great African American entertainers of the early 1900s including performances by Robinson, Horne, Dooley Wilson, Cab Calloway, Katherine Dunham, Fats Waller, and the Nicholas Brothers. Looking back at the beginning of “American Bandstand” and the Philadelphia years 52-64, the film features the original dancers and vintage footage of the teenage regulars and behind the scenes look at a 1950’s and 60’s teenage institution. A special screening celebrating the legendary dance-party show that made television history and set trends in soul and R&B music, dance, and fashion. Relive those incredible “Soul Train” days with historic footage of artists including Gladys Knight & The Pips, Stevie Wonder, B.B. King, Elton John, and the unforgettable “Soul Train” dancers. Performances of classical and contemporary ballet styles featuring a staging of the Sugar Plum Pas de Deux by Dance St. Louis Executive and Artistic Director Michael Uthoff. An exploration of modern dance and the difference between modern, postmodern, and contemporary styles featuring James Robey’s Little Blue Something that premiered at the American College Dance Association conference in 2015. Jazz, Musical Theatre, and Tap Styles featuring work staged by Lara Teeter. The elegant beauty of aerial dance lead by Monica Bremmer of Dance En L’air. A demonstration of break dance styles including popping, locking, breaking, and krumping. A presentation of Thai Classical Dance from the study abroad program at Webster University Thailand featuring dances learned from the Patravadi School Hua Hin, Thailand.